Body acquisition overachievement - what to sell? In a quest to acquire some decent film equipment, I purchased some complete kits from a few users on a motorcycle forum I frequent. I previously posted the ME, which arrived with an M50 F1.7, K30 F2.8, and M100 2.8, Soligor 70-210 F3.5, two winders, cable release, and b&w filters. Put a roll of film thru the ME, and really enjoy using it. 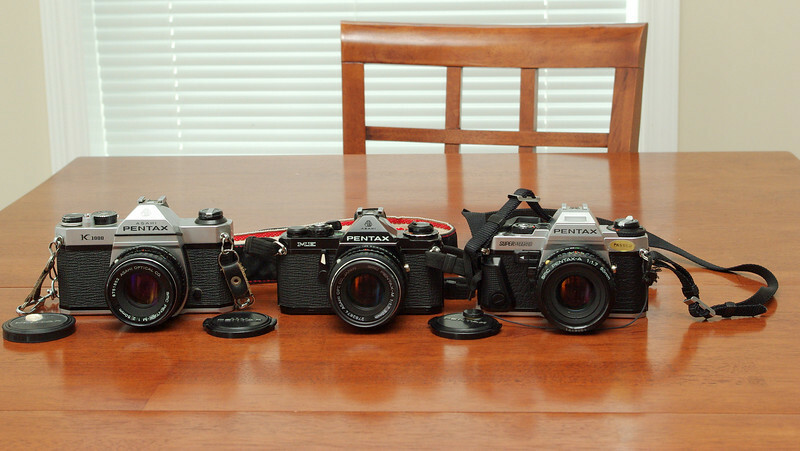 I then picked up a K1000 w/ M50 F2, Vivitar Series 1 70-210, JC Penney 2x teleconverter, and a JC Penney 135mm. Also has an Autorobo flash and some other bits and pieces. Last week someone posted a SuperProgram, A50 1.7 and AF200T, and I couldn't help myself so I picked it up for $100. Now, all together, I have way to much stuff. I never intended to acquire all this, but the majority of it was bundled together by the sellers. I really haven't connected with the K1000, so I'll probably list it for sale, along with the K50 F2 that it came with. The question is, what else to sell? Ideally, one of the 70-210 lenses. Thoughts on which is a higher quality piece? Likely the JCP 135mm as well - the M100 is great, and they are close enough in focal length I can't see the need for both. I don't see manual flash in my future, particularly since the superprogram and AF200T can TTL. So the autorobo probably goes. Any of the rest of it not worth hanging on to? Last edited by grainbelt; 02-16-2009 at 02:17 PM. Reason: model name edits. Last edited by gokenin; 02-16-2009 at 09:28 AM. My bad, it is an M50 F2. Edited original post to reflect this. Vivitar 70-210 has serial of 77379826... where would I find manufacturer? There are several websites listing the table of manufacturers for Vivitar up to the mid-90's. Here is an interesting place to learn a bit more about Vivitar and Pentax - Mark Roberts' Photography business website and PDML opus. Click around - very cool place. The next three digits designate the year and week of manufacture. One digit for the year and two digits (01 through 52) for the week. Obviously, designating the year with a single digit doesn't allow you to differentiate between, say, 1978 and 1988, so you have to infer the decade of manufacture from other evidence (such as when, where and how you acquired the lens, what documentation came with it and the physical appearance of the lens). The remaining digits indicate the manufacturing serial number. Note there was no 77 in the Series 1 manufacturers list. Last edited by monochrome; 02-16-2009 at 04:43 PM. Further review would indicate that the Vivitar 70-210 is not, in fact, a Series 1, but a later, and apparently craptastic, F4.5 Macro version. Think of these things as.. Not stuff you must sell, but things to find homes for. I always used to have a bunch of stuff around I could fix up an give away when someone interested in photography needed it. ....Why not? Be patient. Maybe that long zoom is too sucky to want to buy, but it could be the only long lens in the world to someone for a while. Besides, they don't make em like they used to. The Soligor 70-210 f3.5 might be pretty good. I had a Soligor with not quite the same specs, and it was great but really heavy, almost 3 lbs. You can put together your own package of the K1000, M50/2, JCP 135, TC, Vivitar 70-210/4.5 and Autorobo flash. It may not bring a higher price as a group, but it all leaves at once. If it was me, I would consider selling the K30/2.8 and buying something like the FA35/2. The 30mm is hard to set a value on because it's rare, so maybe you won't come out even on price. But the FA is faster and has maximum compatibility with all both film and digital bodies. I would have no problem dumping the ME either, and keeping the Super Program. Everything else is potentially quite useful. The AF200T is a cool flash for a slave because it has several manual power settings. I really enjoy the ME, it is small and simple, and works beautifully with the M50 and M100. The SuperProgram is a lot of fun to use as well - I really do prefer the split focusing screens in those two bodies, as well as Av on the ME and the other modes on the SuperProgram. Here is a shot of the three stooges from this morning. 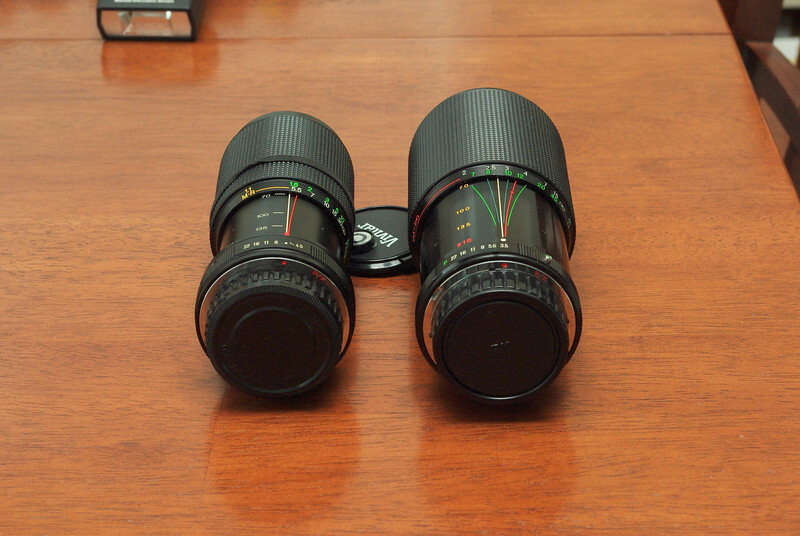 And here are the Vivitar (on the left) and the Soligor. The Soligor is real large and heavy, and the push-pull zoom slips if stood up vertically. I don't have a financial reason to sell any of it, but I certainly wouldn't mind if some it found a new home.. Appreciate all the replies. I put a fresh 36 exp roll in each body, and I plan to shoot at least a roll in each before I make any decisions. Yeah, I got that and edited the post - but I forgot to hit Submit after the Preview. The K1000 gathers a lot more $$$ than it is worth, so if you need sell that one with the 50/2 and one of the zooms.